Definition at line 157 of file detect.h. Definition at line 158 of file detect.h. 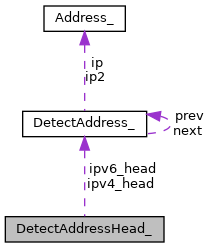 Referenced by DetectAddressAdd(), DetectAddressHeadCleanup(), DetectAddressLookupInHead(), DetectAddressMergeNot(), DetectAddressParse(), DetectAddressParseString(), DetectSignatureSetAppProto(), and SigMatchList2DataArray(). Definition at line 159 of file detect.h. Referenced by DetectAddressAdd(), DetectAddressHeadCleanup(), DetectAddressLookupInHead(), DetectAddressMergeNot(), DetectAddressParseString(), DetectSignatureSetAppProto(), and SigMatchList2DataArray().